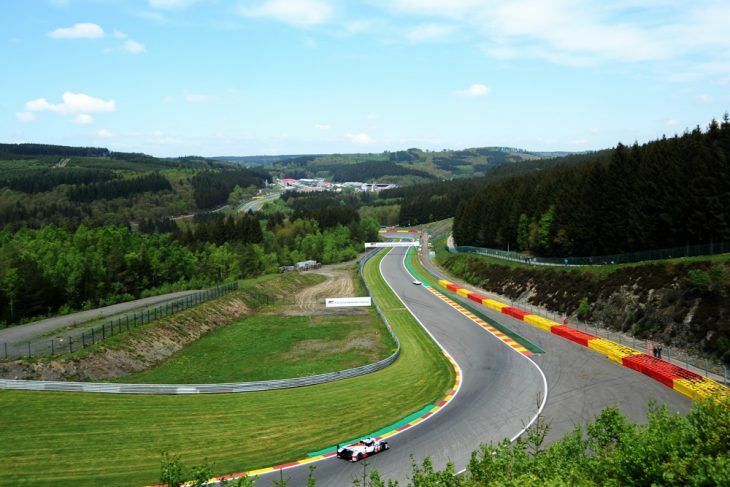 It is another stunning day at Spa Francorchamps, the sun has been shining all weekend thus far and today, race day, we again have clear blue skies and unseasonably (and most un-Spa-like) temperatures. It seems that the public has responded, the autograph session was very well attended, some of the new big name drivers a clear draw. It looks set to be a 33 car starting grid with both CEFC Ginettas, and the badly damaged #10 DragonSpeed BR1 conformed non-starters. The #7 Toyota will start from pit-lane after the technical infringement in qualifying yesterday with the car set to lose a full lap at the start. Starting from the back of the grid will be the #17 SMP Racing BR1 AER after the car’s electronic glitch in qually. With the #7 Toyota relegated to the back of the grid the #1 Rebellion R13 starts from the front row alongside the new pole sitter, the #8 Toyota. That marks the first time that a non-hybrid LMP1 has started from the front row of an FIA WEC event since Silverstone in 2012 when Allan McNish put his Audi R18 TDI Ultra second in qualifying, the final event before Audi switched from a mixed entry to an all E-Tron hybridised line-up. Michelin has been fined €5000 euros with €4000 suspended for its breach of Article 7.7.1 of the WEC Sporting regulations earlier this week. “Mr Mondain explained that iut was not possible in the factory to iderntify the tyre by RFID but only by barcode. Arriving in Spa Michelin realised an error in the amount of tyres and a difference if the accordance of RFID and the barcode. Due to the correction the final list has been declared so late. “The late declaration delayed the planned schedule of the scrutineering and the scanning of the tyres by the scrutineers. “In accordance with Art 13. 1.3. FIA WEC Sporting Regulations and Art 1.3 Internatuonal Sporting Code Michelin is considered as a Participant of the event and undertake himseld to the decisions of the Sporting authority. The #86 Gulf Racing Porsche is set to start today’s race from the back of the grid, after the Stewards deleted all the car’s laps in Qualifying for speeding in the pit lane at the end of the session.